This chic diamond chevron necklace draws inspiration from some of the most minimal forms in nature. Reminiscent of the chevron peaks of the Hollywood Hills or the outline left by waves on the glittering evening sand. Sparkling, clean and modern, intersecting lines of diamonds catch and reflect light. 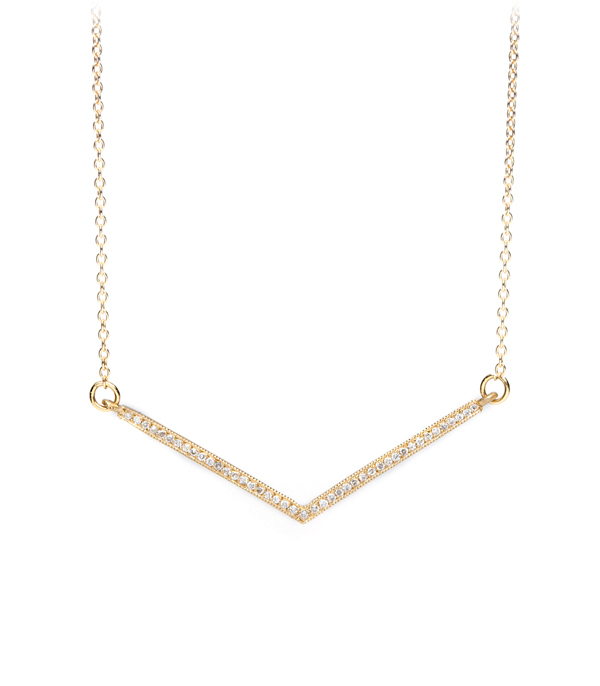 Easy to layer, this tiny sparkling gold bar necklace can seamlessly fit into most any style. When worn alone it make an ideal everyday piece to elevate a casual outfit while running to the Farmer’s Market or grabbing a mocha. We’d pair this minimalist chic necklace with our favorite rose cut diamond hexagon necklace for a layered look. This modern gold necklace is set with 0.12 ctw of brilliant cut diamonds and handcrafted by our artisan jewelers in Los Angeles.